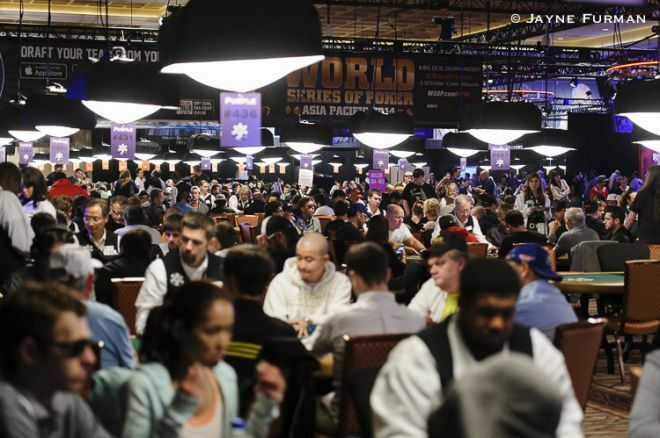 Anticipation is building at the 2014 World Series of Poker Main Event as the 1,864 remaining hopefuls still part of poker’s most prestigious tournament edge closer to making the top 693 and the money and thus continue their journeys toward the $10 million first prize. After battling through separate flights for two days each, all players will be combined today and will remain so to the end, with this year’s November Nine scheduled to be determined next Monday. 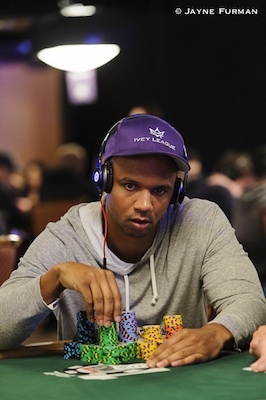 Ten-time WSOP bracelet winner Phil Ivey comes back to the biggest stack of everyone to start today’s Day 3 after having amassed 505,000 chips by the end of play last night. Last year on Day 3 a slightly smaller starting field played from 1,753 down to 666 players — just 18 spots shy of the cash — with the money bubble then bursting early on Day 4. Today’s schedule calls for five more 120-minute levels to be played, and so expect the tournament to get near that bubble by night’s end. Joining Ivey near the top of the counts to begin play today will be Tim Stansifer who finished Day 2a/b with 481,500 and Raul Mestre who bagged up 477,900 last night. Before play began yesterday we took a moment to consider Ivey’s past Main Event performances, noting how he’d cashed four times before and in fact had made deep runs on each occasion. Ivey’s lowest finish when cashing in the Main was 23rd in 2002, while his highest was in 2009 when he made the final table to finish seventh — the last time Ivey made the money in the Main Event. By the final level yesterday, Jared Bleznick (who’d end the night with 206,500) was already starting to suggest that Ivey was “even money to make the final table.” Ivey dismissed such talk as “crazy,” even offering to bet on himself not making it that far, given such odds. Like Ivey has done this year, a year ago Mark Kroon started Day 3 as the chip leader and only player to have collected more than 500,000 chips. Kroon would drop a few but still make the next day with a stack that was above average, but not long after the money bubble burst on Day 4 he’d lose his stack to finish 458th. 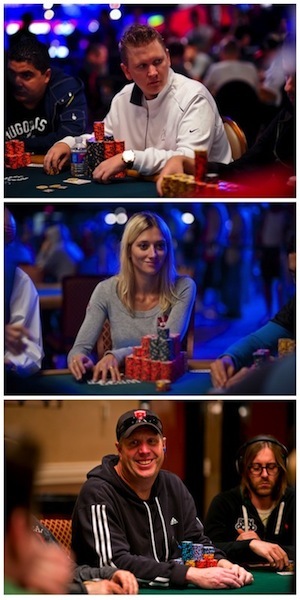 Other start-of-Day-3 leaders have managed better, however, including Gaelle Baumann who just missed making the final table two years ago, the late Amir Vahedi who final tabled in 2003, and Ben Lamb who would make it all of the way to a third-place finish in 2011. Since 2000 all from this group but Sammy Farha — who led to start Day 3 in 2001 — went on to cash, with Julian Gardner coming the closest to winning by finishing runner-up in 2002. The man to whom Gardner lost heads-up in 2002, Robert Varkonyi, is still alive in this year’s Main Event and will return to a stack of 33,800. He’ll be joined by four other former Main Event winners: 2003 champion Chris Moneymaker (220,000), 1996 champ Huck Seed (96,500), 2013 champion Ryan Riess (84,900), and 1987 and 1988 champion Johnny Chan (46,600). Start-of-day-3 chip leader from a decade ago Abe Mosseri returns to a healthy stack of 260,500 today. He’ll be one of a number of notables coming back to big chips, including Brian Townsend (361,700), John Hennigan (342,700), Martin Jacobson (342,700), Paul Tedeschi (336,600), Griffin Benger (305,900), Ali Eslami (287,900),Grayson Ramage (285,100), Antonio Esfandiari (277,800), David Paredes (258,000), and Tom Middleton (252,400). Among the others sitting ahead of the current chip average of 107,559 to start play today will be Jonathan Dimmig (248,200), Daniel Alaei (228,300), Mark Newhouse (220,400), Jeff Madsen (217,000), Kory Kilpatrick (216,000), Ronnie Bardah (215,800), Artem Litvinov (194,200), Angel Guillen (193,100), Layne Flack (186,000), Marvin Rettenmaier (173,200), Phil Galfond (165,900), Haralabos Voulgaris (164,700), John Juanda (133,700), and Erik Seidel (130,600). Also part of today’s Day 3 field will be Barry Greenstein (113,500), Jake Cody (80,000), UFC announcer Bruce Buffer (71,100), former NBA player Earl Barron (74,000), current NBA star Paul Pierce (48,600), Daniel Negreanu (39,800), and Jay Farber (37,600). Incidentally, something else to watch for will be Pierce joining PokerNews and the Global Poker Index for a Google Hangout today at about 2 p.m. PDT. Cards go back in the air at 12 noon PDT, so start checking those Main Event live updates then to follow all of the Day 3 action.